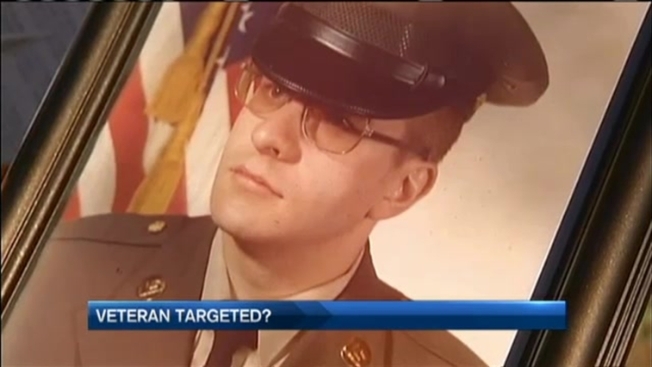 A disabled veteran in Derry, New Hampshire, said he feels targeted after vandals struck his car three separate times since last Wednesday. Derry police are still investigating. Captain Vern Thomas said he does not believe this man is being targeted for his military service, but that all of this could very well be about a parking spot. Barry Laughton and his wife Nancy have lived at the Fairways Apartments for more than seven years. "The vandals came right on down with the spray," Mr. Laughton said referring to his white rental van which he says he got after his personal car was vandalized twice last week. "I saw dog poop all over the window, all over the handle," he said. Because he thought the first incident was a Halloween prank, Laughton didn't report it to Police. The next morning when he woke up to his vehicle covered in orange spray paint, he called police. Laughton, a veteran who spent three years as an army specialist stationed in Hawaii, can't figure out what he did to deserve this. "That's what's got us baffled, we don't know what we did to somebody," Laughton said. He and his wife say the only clue is the way the vandal specifically targeted their handicapped license plate. "There is three of us in the whole complex that they have given a handicapped spot to," said Nancy. "That could be the reason, that we were given the spot and they weren't." "It is possible it has something to do with the parking spot itself," Capt. Thomas said Monday. A veteran on a fixed income, two days before Veteran's Day, trying to figure out how anyone could be so hateful. "I don't think they have any type of regard for this country or anyone that serves," Loughton said. Neighbors who have lived at the Fairways for years say this is the first time they've felt unsafe. The couple says if this happens again, they're considering moving out of town.